The marine environment contains a large amount of anthropogenic plastic pollution. While the Northern Hemisphere subtropical gyres (NHSG) have been found to contain plastics, there have been no data to suggest the existence of plastic pollution in the Southern Hemisphere subtropical gyres (SHSG). Recently, a large amount of plastic pollution has been found in the Southern Pacific Ocean and along the coastal shores. It has began to negatively impact fishing, tourism and navigation. In addition to the South Pacific, large amounts of plastic have also been found in the Southern Ocean and near Antarctica. In order to look at the presence of microplastics in the South Pacific subtropical gyre, Eriksen et al. (2013) surveyed a transect that crossed directly through the gyre and took 48 samples. This transect was based on an accumulation zone created by currents and wind. The study found a greater amount of surface plastic pollution near the center of the transect than on the edges. These data prove… the existence of a garbage patch in the South Pacific subtropical gyre. Eriksen et al. organized an expedition to the Southern Pacific Ocean to collect data and explore the accumulation of plastic pollution. Along a 2424 nautical mile transect from Robinson Crusoe Island to Pitcairn Island, 48 samples of nueston, the organisms on top of the water, were collected. Starting at 33°05’S, 81°08’W, samples were collected every 50 miles. After Easter Island, samples were collected every 60 miles until Pitcarin Island. A manta trawl was used to collect the sea surface samples. The net was towed on the side of the boat for a maximum of 60 minutes. The samples were stored in a 5% formalin solution. The sea state at the time of collected was calculated by looking at wave height and using the Beaufort Scale. When placed in salt water, the plastic material floated to the top and under a microscope was removed. They were sorted into six size categories, which were then analyzed as to type of plastic: fragment, polystyrene fragment, pellet, polypropylene/monofilament and film. Of the 48 samples, 46 were found to contain plastics (96%). There were on average 26,898 pieces of microplastic per kilometer, weighing 70.96 g. A large majority of the count and weight was collected in the center third of the transect, which is where the plastic accumulates in the instance of a garbage patch. All six size classes were present in the samples and five of the plastic types were found. Fifty-five percent of the plastic particles were found in the size category of 1.00– 4.75 mm. The most common type of plastic was fragments followed by plastic lines and films. The least common was plastic pellets although their total weight was still quite high. The sea state at each sample seemed to show an inverse relationship with the plastic count/weight; when the sea state was high, there was a low abundance of plastics and vice versa. This experiment indicates that the South Pacific gyre has a greater abundance of particles than the North Pacific gyre but says nothing about the abundance of plastics between gyres. This is due to the larger size of the SPSG, which skews the model. In reality, there are more plastics in the northern gyres as a result of greater amounts of production and consumption. The SPSG results are smaller than those of the NPSG, but are found to be within a similar magnitude. These results may vary depending on if there is an abundance of particles on the sea surface or below the surface. It is possible that microplastics wash up on shore, are ingested by marine animals or are driven deeper by waves and turbulence. 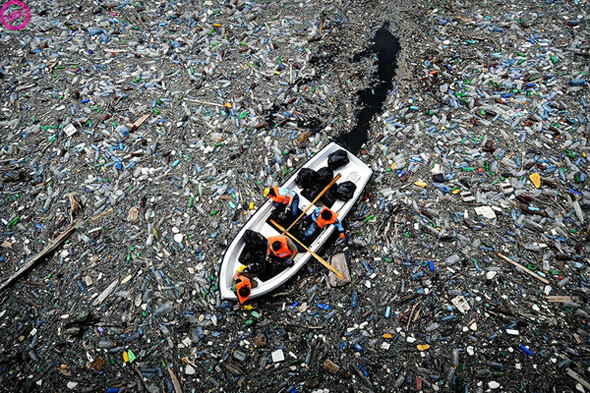 In these gyres, plastics form an accumulation zone as a result of surface currents that push the particles together. The plastic comes from rivers, beaches, maritime activities and illegal dumping. Overtime, it breaks down into smaller plastic particles as a result of wind and waves. Many of these plastics are petroleum-based and are considered a pollutant in the marine environment. Marine life is also affected by plastic entanglement and ingestion. Plastic particles in the SPSG probably come from countries around the South Pacific Ocean, especially South America. Much of this plastic washes up on shore, but a large amount is also found to be in the South Pacific subtropical gyre. It is quite probable that some of the plastics are carried from as far as the South Atlantic and Indian Oceans. Cross equatorial transfer of plastics is also a consideration as some of the plastic may be from the North Pacific gyre. The results of this study prove that there is a garbage patch in the South Pacific filled with plastic pollutants. This experiment helps to predict the distribution of plastic particles around the globe and how they accumulate. With this information, it becomes possible to mitigate plastic pollution in the future. This entry was posted in Chloe Mayne, Marine Pollution and tagged Ann Zellers, Anna Cummins, Gwen Lattin, Jan Hafner, Marcus Eriksen, Marine Environment, Martin Thiel, Nikolai Maximenko, Plastic Pollution, Samuel Rifman, South Pacific Subtropical Gyre, Stiv Wilson by Emil Morhardt. Bookmark the permalink.